HomeStoriesPress releasesGreen light for 1040 New Homes in Lanarkshire Hot-spot! Green light for 1040 New Homes in Lanarkshire Hot-spot! A master-plan outlining an exciting North Lanarkshire property development has been approved by the Council’s Planning Committee. The plan which will see 1040 new homes developed in the pleasant village of Glenboig was put to North Lanarkshire Council’s Planning and Transportation Committee on 8 July 2015, by Hamilton based Banks Property. Part of a Scottish Government approved Community Growth Area, the development has been carefully designed following years of community engagement, including many public events and direct meetings. 119 letters of support were submitted to the Council and the project won the backing of many businesses in the area. “This is a real milestone for a project which has required huge efforts over many years by the team at Banks Property, as well as the many folk in the community that have given their time to support the project and providing feedback to the team. 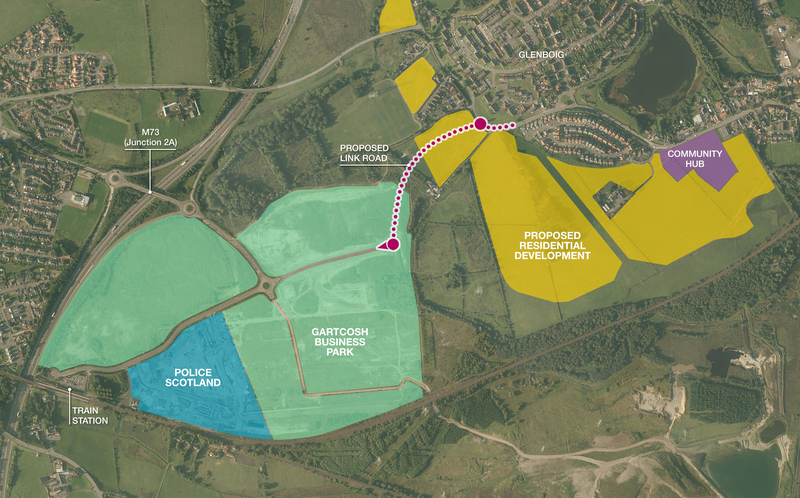 The Glenboig Village project has the potential to provide a huge economic boost for North Lanarkshire, representing a £200 million investment, whilst facilitating an estimated 700 jobs – with firms in the local area encouraged to join the supply chain. Included in the masterplan submission are details of a community hub that will provide for local retail, healthcare and convenience shopping facilities. There will also be an extension to the adjacent Gartcosh Nature Reserve and the long awaited link road to Gartcosh Business Park, the local railway station and the M73. Innovative ‘newt underpasses’ designed to encourage the local population of Great Crested Newts to move between habitats helped to secure planning for the link road and will encourage the newt species – one of the largest in the UK – to flourish in the newly expanded nature reserve. Carefully designed measures to capture and move the newts out of harm’s way ahead of construction starting were successfully awarded a licence by Scottish Natural Heritage recently and this will allow Banks Property to commence work on the project whilst ensuring the wellbeing of this important species. Colin added: “As we’ve found out during our years of studying the area, Glenboig Village is a haven for wildlife and is set within a beautiful landscape, yet it will soon be within 20 minutes by road or rail from Glasgow, Stirling, Motherwell and Cumbernauld. It has already got good education and leisure facilities and a fantastic community spirit. “The only thing missing has been the lack of the direct connection to the motorway and rail network, however with this “missing link” now to be provided, the future looks rosy and our Glenboig Village development is set to transform an area which has seen little investment in recent years. “On the back of this development I expect businesses to increasingly look to locate to Glenboig and Gartcosh Business Park, to make use of the excellent infrastructure connections, the great environment and the ready-made workforce on the doorstep. Banks Property first submitted its masterplan for the 1040 home Glenboig Village project to North Lanarkshire Council in August 2014. The 1,040 homes earmarked for Glenboig are part of the Gartcosh and Glenboig Community Growth Area which is aiming to deliver 3,000 new homes in total. It is estimated this whole development will support approximately 2,500 constructions jobs and provide a boost of around £1 billion to the North Lanarkshire economy.